For close to 50 years, Maine Family Planning has been the sole Title X grantee for the state of Maine, administering a bedrock federal program enacted under President Richard Nixon to ensure everyone has access to quality family planning services, regardless of how much money they make. At our 18 clinics statewide, and working with partners like Planned Parenthood of Northern New England and community health centers, we serve roughly 22,000 low-income women, men, and teens each year, offering expert care to folks in underserved communities statewide. Our Title X patients rely on us for affordable birth control, STD testing and treatment, and cancer screenings, along with other preventive health services. Others depend on us for compassionate, non-judgmental abortion care, which we provide as an entirely separate service, as per existing federal law. Reproductive freedom is a core tenet of the MFP mission. The Trump-Pence administration is attempting to undermine the important work we do, by implementing what’s known as a “Domestic Gag Rule.” The proposed rule, published June 1 in the Federal Register, would prohibit providers who perform abortions – or even make referrals for abortion care – from receiving Title X funds. Let us be clear: This is a political assault on women and families nationwide that will make it harder for poor and rural Mainers to access quality health care. It is an attack not just on abortion rights, but on the doctor-patient relationship and on the values we hold at the center of the MFP mission. We have a responsibility to our patients, and we intend to fulfill it. We will not cede Title X to those who would sabotage it, but rather we will fight to preserve it as it was designed. Were we not providing these services in Maine, a less scrupulous organization might step in to fill the void—one without our proven track record of serving tens of thousands of poor and rural folks. One without our compassionate, expert staff spread across 18 clinics in Maine. One less committed to medically accurate care. MFP will fight implementation of the Gag Rule every step of the way. Publication of the rule kicked off a 60-day comment period that ends July 29. We intend to submit comments vigorously opposing this proposal and will encourage our supporters to do the same. 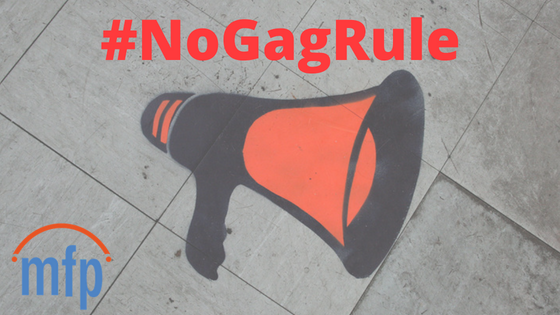 Have you seen our infographic explaining What’s Up With the Gag Rule (below)? Once the comment period is closed, the government will publish a final rule. Only then can we take legal action, and you can be sure that, if the final rule looks like the proposal put forth last week, we’ll take this battle to court. In the meantime, nothing will stop us from fulfilling our mission of providing the full range of reproductive health care to people who need it. We are committed to continuing to make quality abortion care available in Maine, regardless of geography, income, or situation in life. Follow along as we fight the Gag Rule.